We got a Squirrel that was giving to use because it had a broken leg. We are currently taking care of him. Don't know if he is going to make it or not. He was starting to make a clicking noise why breath last night..(not a good sign) well hopefully he'd make it. am sorry to hear about the broken leg. I hope he turns out for you.now is he a red squirrel or a gray? Actually he's a black squrriel. Some lady found him on the road and picked him up. But she didn't know how to care for them. Its funny that squrriels when they are hurt they will accecpt help easily. if they can walk and need help they will pretty much crawl into your hand. A good luck on the rehab of the little thing. I hope it works out and where's the pics man. No pics isn't fair.. :) Just messin with yea..
A kind heart and TLC can not only go along ways, but make a huge difference. He is doing a lot better so far. eating real good! Here is a pic of him. Pictures kinda dark took it with my phone. aww poor little guy. We actually have canadian black squirells in Washington, DC (where I live most of the time), a gift from your peoples to mine =). Man its black coat is nice. Is it eating solid foods or do you have to feed with a bottle? Insanity wrote: Actually he's a black squrriel. Some lady found him on the road and picked him up. But she didn't know how to care for them. Its funny that squrriels when they are hurt they will accecpt help easily. if they can walk and need help they will pretty much crawl into your hand. that is very true. I have seen a squirrel take a squirrel a car hit and actually carry it off the road and thats no lie I will never ever forget that. I am glad your trying to get this guy straitened out. I think thats awesome him being black I used to hunt squirrels and never once saw one in the woods here although my brother says he used to see them all the time when he worked up in columbus. anyways I hope all goes well with this little guy that be a pretty sweet pet. So far the Squrriel is doing great! He is eating a lot! 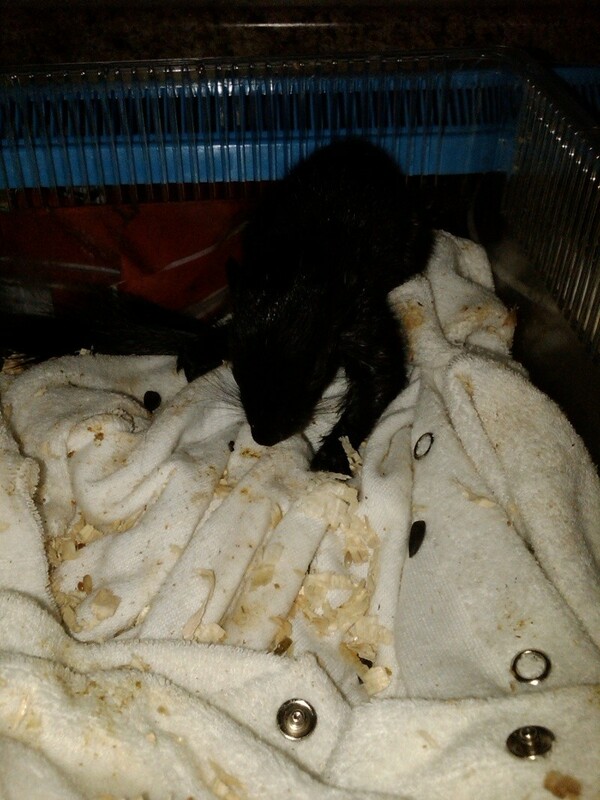 Squrriels are one of the hardest to rehabilitate from what I hear, But this is going to make it. A Insanity, hows the rehab coming any updates? The squrriel is doing GREAT! He is starting to eat hard food. He still like the formula but he's eating a lot of peanut butter, seeds and nuts. He's getting bigger and stronger. He deffinately likes to tangle himself into hair. I'm glad he's doing well! Everyone who has seen him wants him. We have had some offers on him but we are not selling. We are going to keep him. Since, he will pretty much come to you when you call him and has no problem being handled by people. This is great too hear! A hows your little guy coming along? Hows the little critter doin Tom?? ?...any updates?? ?